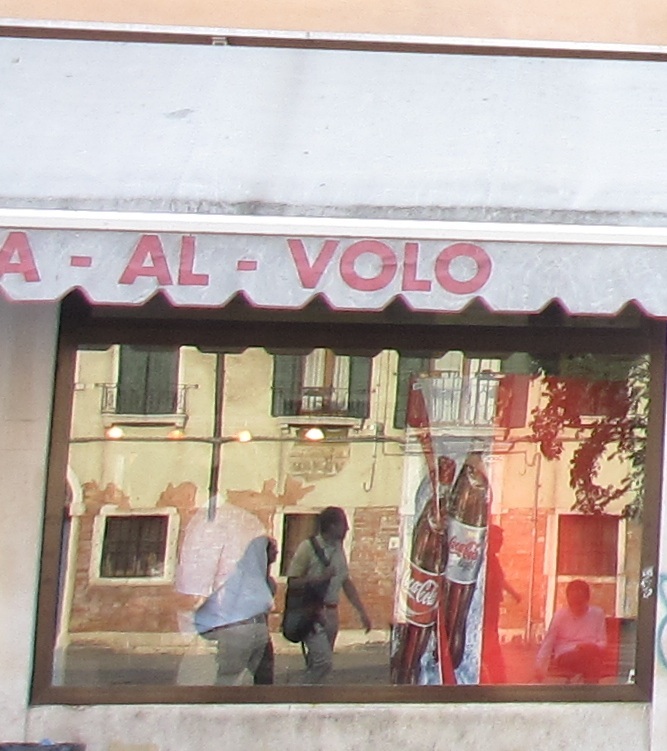 Pizza al Volo is a bit of a Venice institution. Some friends told us about it a few years back when we went to Venice but we didn’t manage to find it on that trip. On this visit, Mrs. NH had it on her itinerary an Little NH and I were happy to be along for the ride. After a twisting, turning walk through the streets of Venice, we arrived at Campo Santa Margherita. The campo (or plaza) is really neat in and of itself. Cafes line the periphery and you get a pretty authentic feel. It’s definitely not as full of white tennis shoed tourists as much of the rest of Venice and that’s a nice change. They came back with a couple slices of Margherita pizza and a slice topped with zucchini. Both were very good. Was it the best pizza I’ve ever had? No. I had probably become jaded on Italian pies by that point in the trip. That said, it was tasty. And when Mrs. NH went back inside for another piece, I was glad to see her come out with another one topped with zucchini. So, would I recommend it? Sure. Is it the best pizza ever? No. Is it better than most? Yep. For Pizza al Volo, two out of three ain’t bad. If I am a seeker of delicious food, Mrs. NH is a “Dog the Bounty Hunter” of it. She found the best restaurant in Venice, made reservations, and made darn sure we got there on time. This, on the second-to-last day of our trip, all while dragging an over-caffeinated NH and road-weary Little NH with her. She rules. 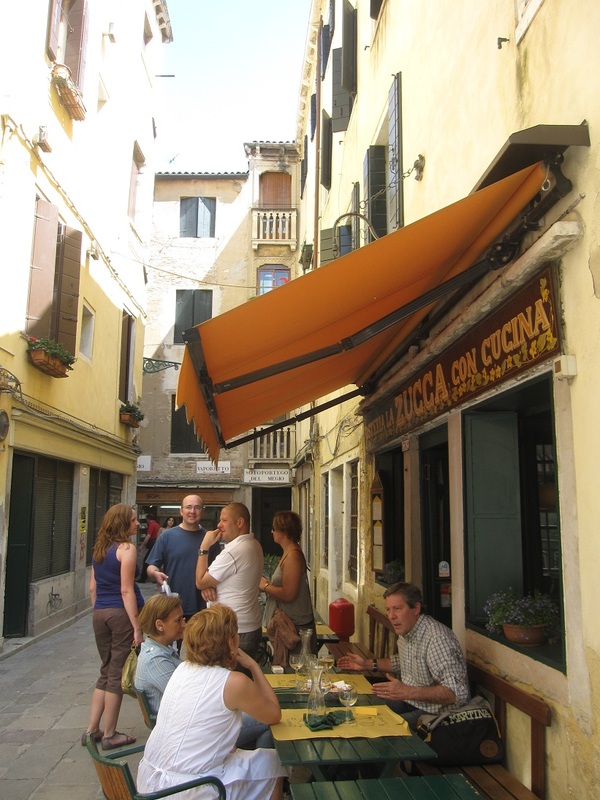 The destination on this outing was La Zucca, a largely, but not totally, vegetarian restaurant in the back streets of one of the least touristy areas in Venice. She had seen it written up in review after review on the Internet and managed to get a reservation before we left Prague. It’s an unassuming little corner restaurant, right next to a tiny canal, small bridge and skinny pedestrian street. It’s just about as cozy as it gets in Venice. There were about 6 outdoor tables and two ladies taking orders. Service was friendly, efficient and they even offered to make a half portion of pasta for Little NH. Since little NH had consumed 1/2 a bag of bagel chips on the way, we took the server up on her offer. On the other hand, Mrs. NH and I were starving. 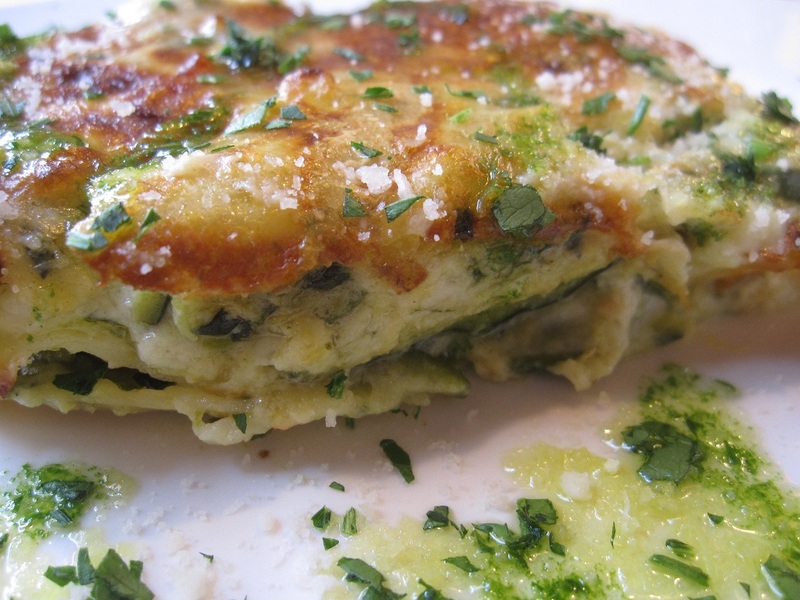 We both ordered the Lasagna with Zucchini and Pumpkin Flowers and split an order of the Broccoli Aglio Olio. 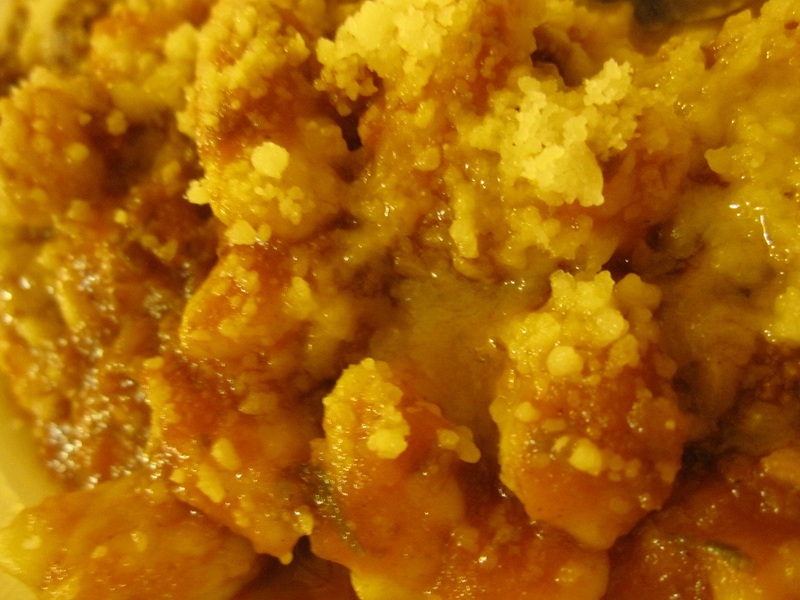 The lasagna was rich, gooey and striated by fresh, perfectly cooked pasta. The pumpkin flowers gave the dish bright highlights of orange amongst the cream and green of the zucchini. It was earthy and full of good texture. I could have eaten a whole pan of that stuff. It was perfection. The broccoli was simple, straightforward and equally tasty. That’ll be a dish I’ll try at home very soon. After all of this and a liter of wine, the caffeine edge was worn away leaving a blissed-out, pleasantly full, food-lover sitting across from a food bounty hunter on a mission. Next stop, pizza. I had this little conversation with myself during the umpteenth course at Agriturismo La Colti somewhere outside of Olbia, Sardegna on a warm spring night. Mrs. NH had sought out another great restaurant and managed to program the Garmin nüvi to get us there. Before that thought hit, we were served with course after course of good food. 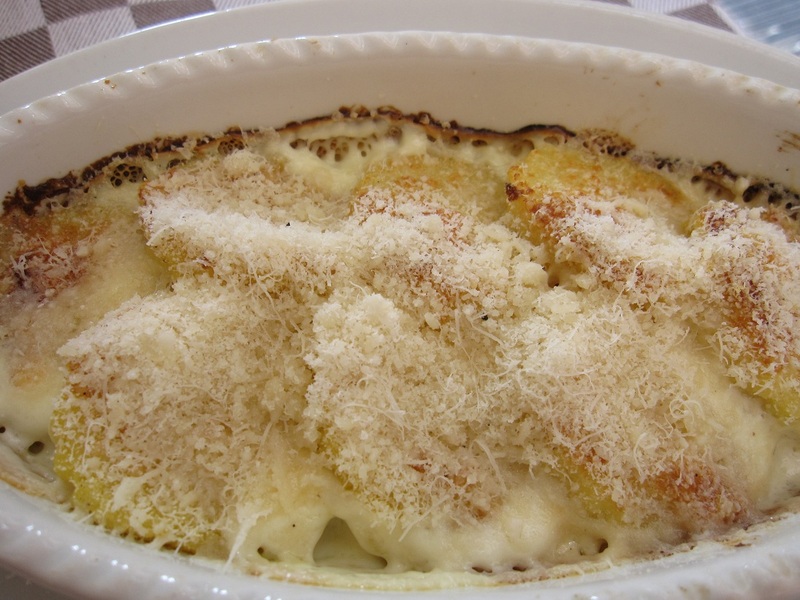 We had artisan gnocchi (also called Gnochetti Sardi), gently fork-dimpled just enough to hold a generous coating of meat sauce. The gnocchi was a firmer consistency than I was used to but Mrs. NH was happy to finish what I didn’t. 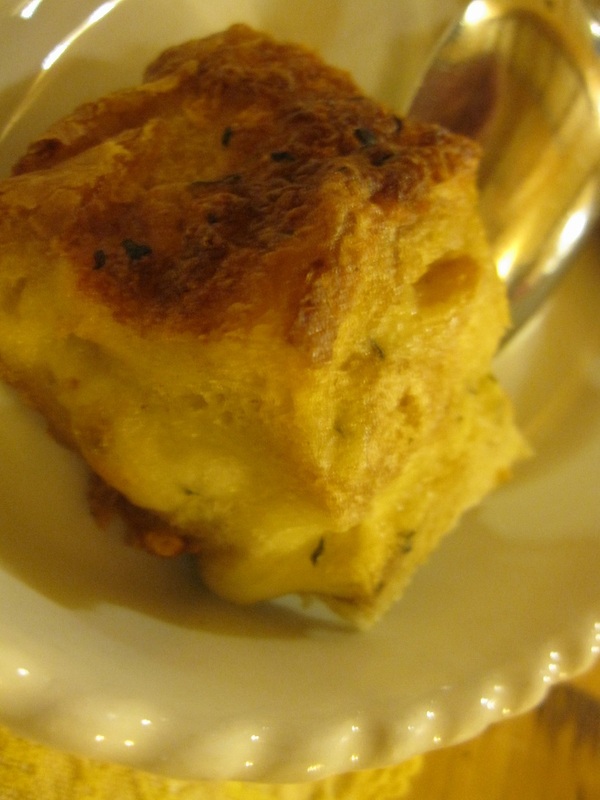 The other dish that stuck out was the puffy, pastry/lasagna-like dish. It’s pictured at the top-left of this post so if you know what it is, let me know. Topping that all off was a tender, fatty suckling pig (Porchetto Mirto) served on top of some myrtle branches. But back to the burro. So, there I was, in the middle of a freshly prepared, delicious, typical Sardegnian meal wondering if I was eating Eeyore. Donkey is apparently a typical dish in those parts. Luckily, I’ve eaten plenty of weird things in my life and the though of it didn’t bother me too much. But it did get to the crux of my only beef (pun not intended) with the meal at La Colti. There were some awesome dishes but as it was pre fixe, nothing was written down and when plates arrived I had little idea what most of them were. The girl who slapped them on the table said what some of them were in rapid Italian but others she just placed on the table and ran off looking like she was about to go put out a fire on the roof. Sure, I could tell there were tomatoes on the plate and I managed to catch the word for pork in the split second after she slammed the plate down and disappeared into thin air, but lots of other things just got devoured without knowing exactly what they were. 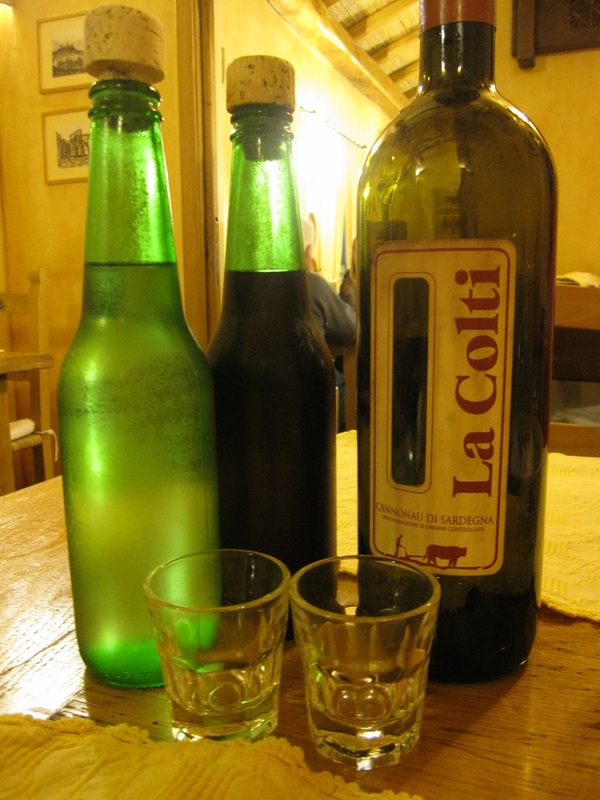 Also served were local wines in La Colti labeled bottles and a super-tasty jug of Mirto for dessert. Those, I had no problem identifying. That said, it was all good. I’m afraid I’m just not in much of a position to tell you what all of it was. But I did catch one word in particular. “Pecora.” It sounded like Pecorino so even the slightly mirto-dulled synapses in my head fired enough to register it. And, I remembered the word until the next day, 99% sure it was Italian for Eeyore. When I pulled the Italian dictionary from my backpack, I was relatively pleased at what I found. Pecora – Sheep. Huh. Not baaaad. Better yet, I can still record episodes of “My Friends Tigger and Pooh” for Little NH with a clear conscience. Some day in the future, when I make bazillions on some great idea that I have in the middle of the night, I’m going to buy houses and apartments all over the world. One of them will be in Rome and it will be just down the street from Matricianella. Not because the neighborhood is any better than any other place in Rome, but because I know Mrs. NH will want to go there all the time. At least if I have an apartment near it, it won’t take long to get there. Not to mention the fact that I’d hate to miss a meal there. 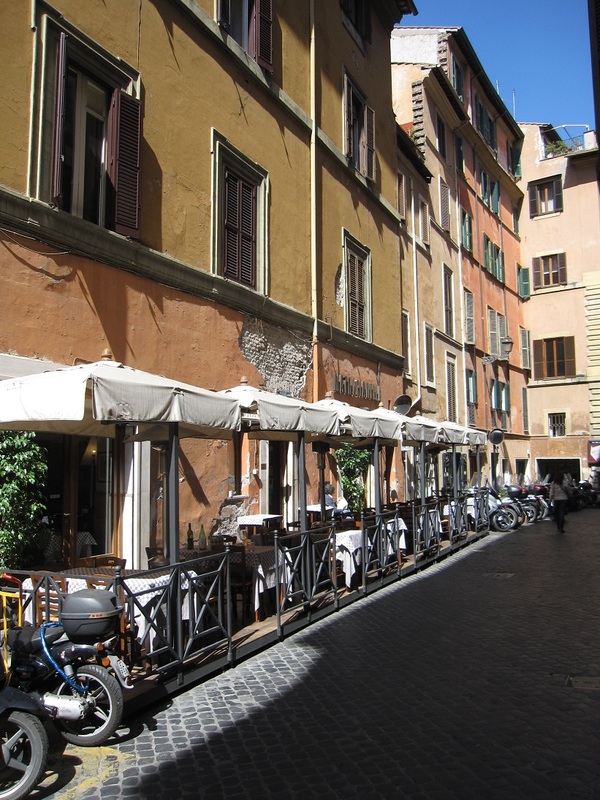 Matricianella is nestled in a side street just down the way from the Spanish Steps and features a steady yet unobtrusive promenade of scooters and delivery vans just off its skinny front deck. What happens on the other side of that deck, however, is the creation of some of the most delicious, classic, Roman food I have ever witnessed. Mrs. NH discovered it in Food and Wine magazine about five years ago and we haven’t missed a stop there in any trip to Rome since. Of course, that’s not always easy. If you don’t speak Italian, good luck trying to get a reservation. Mrs. NH tried twice. As soon as she called and English words escaped her mouth, “Click.” Both times. Pshaw, I though. She’s just not doing it right. “Buon giorno! May I make a res…” “Click.” So, we took our chances and walked over with Little NH hoping to score an open outside table for lunch on a weekday without a reservation. The gods smiled upon us and we got a nice table outside. After the reservation fiasco, I was a little worried that the previously friendly service had been replaced by some snooty staff that hated gringos with only a passing knowledge of Italian. My fears were unfounded, thankfully. Service was quick, courteous and even extra sweet to Little NH. They’re pros at Matricianella. No wonder they don’t take reservations in English over the phone. It is Italy, after all. The food is rustic, hearty and not at all fussy. It’s just excellent and perfectly executed. We started out with the fried ricotta and bresaola salad. 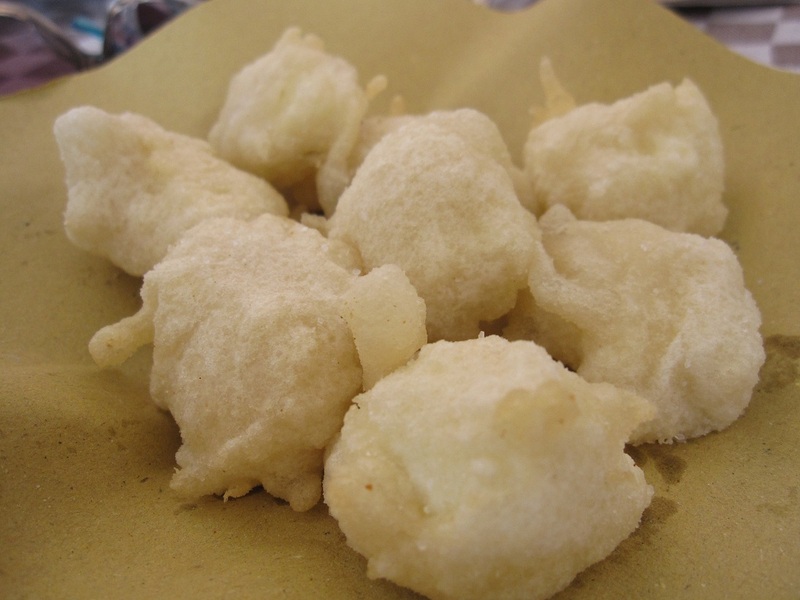 The fried ricotta was like eating little pillows of pure epicurean pleasure. I had never had the dish before but I intend to never miss it on a menu again in my life. 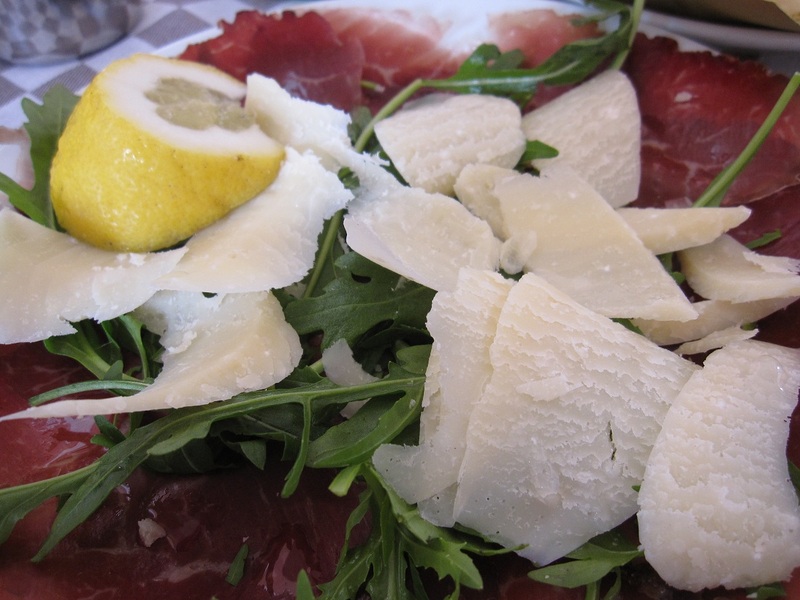 The bresaola was elegant and perfect, served with a good slab of lemon, peppery arugula and savory chunks of parmesan. For the main course, I had the Veal Saltimbocca and Mrs. NH had the Gnocchi alla Romana. We ended up splitting the dishes and it was a great combo. 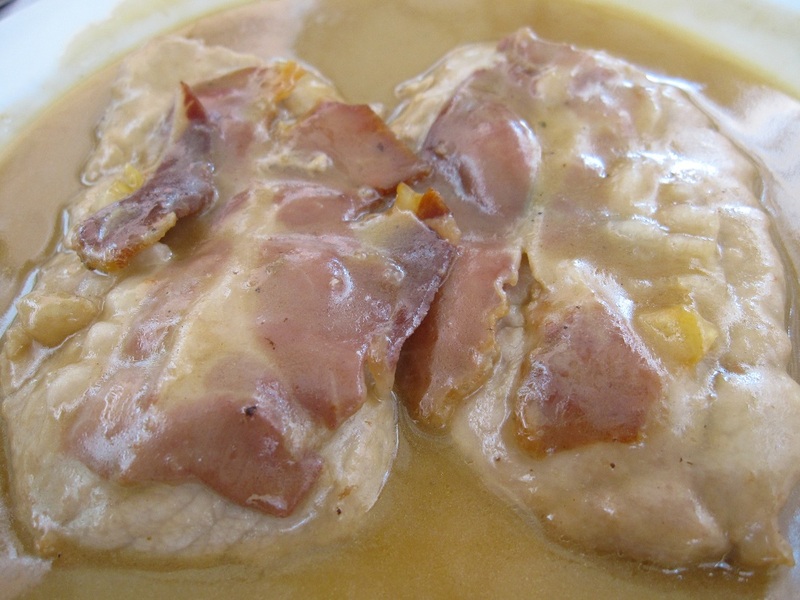 The Saltimbocca had a rich gravy and excellent cuts of meat. Melt in mouth. Mrs. NH’s pillowy pasta was amazingly rich and incredibly comforting. Kind of like something mom would have made if she was Italian. Just yum city. That and a bottle of wine and we ended lunch as two happy patrons. Little NH didn’t fare too poorly, either. She had penne with tomato sauce and lots of grated parmesan and she, too was in a pretty big food coma by the end of lunch. Topped off with a little biscotti and life-giving espresso, we were ready to tackle the afternoon in Rome. It was the perfect Roman lunch.